I've worked on Wall Street my whole life. The first film was cut throat Ivan Boseky insider trading and raw greed at its finest. Michael Douglas was simply riveting. I had been waiting for the sequel ever since announced. Going opening day, I was stunned after watching it the first time. 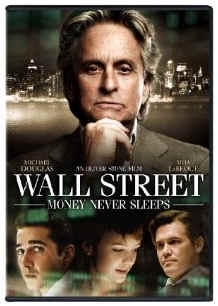 Yes, Oliver Stone nails the Collapse of Wall Street in 2008 with the mortgage meltdown. Every character can be parlayed into a real life individual involved in the Bear Stearns and Lehman collapse. But the real story is about second chances in life, fighting for family, doing the right thing, commitment to work and the price paid for loyalty. Shia Labeouf (Jake Moore) is at his best when he sets out on a course of vindictive revenge after James Brolin (Bretton James) causes the "perceived" collapse of Keller Zabel(KZI) and the suicide of his mentor and KZI's leader Lou Zabel. What Do Customers Ultimately Buy After Viewing Inside Job ?